Elliott divided the moves the market makes in two clear and distinct categories: impulsive and corrective waves. An impulsive wave, as the name suggests, implies the market is traveling, while a corrective wave implies the market is ranging. This is a tricky statement thought, don’t be fooled by appearances. Markets are spending most of the time in corrective waves, but this doesn’t mean prices are ranging. As a matter of fact, a corrective wave can be more violent than an impulsive wave. This is because, of a lower degree, the corrective wave is made out of multiple impulsive waves part of the overall correction. 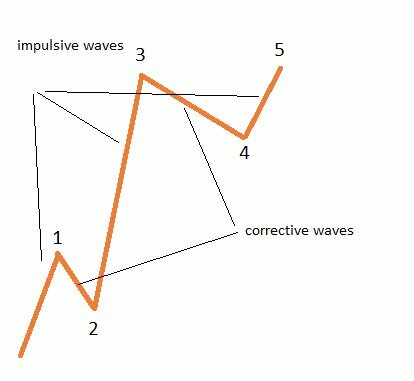 An impulsive wave is also called a motive wave, but the overall idea is the same: it is a five-wave structure that is advancing (in a bullish trend) or declining (in a bearish trend). The rules of an impulsive wave, like any rule with the Elliott Wave theory, are clear and leave no room for interpretation. According to Elliott, at least one wave in an impulsive move must be extended. As a rule of thumb, the extension means that the wave is bigger than 161.8% of the previous wave. The most common extension is a so-called 3rd wave extension. This means that the third wave is the longest/biggest wave to be seen in the five-wave structure that makes up an impulsive move. The image below shows a five-wave structure or how an impulsive wave should look like when the 3rd wave is the longest or the extended wave. This is happening most of the times, and by this, I’m talking about over seventy percent of the times. Under no circumstance, the third wave cannot be the shortest wave out of the motive waves that make an impulsive move. That is, when compared with the 1st and the 5th wave, the 3rd one cannot be the shortest. This simple rule makes the difference between correct and wrong counts. Simply go on Google or on another search engine of your preference search for Elliott Wave counts on any popular currency pair. After doing that, select the Images tab. You’ll see that there are plenty of Elliott counts out there, but few respect this mandatory rule. This means that the count is invalidated and the overall forecast or conclusion is wrong. The two corrective waves in an impulsive move are the ones that deserve the most attention. This is because they are the most time-consuming patterns. Once again, it is proven that price is spending more time in consolidation than trending. This is valid in an impulsive move too. The 2nd wave cannot retrace beyond the 1st wave’s beginning. If that is happening, the move is not impulsive. The problem with counting waves under the Elliott wave principle comes from the fact that such a five-wave structure like the one above represents a single impulsive wave of a bigger degree. It could be the 1st wave of a bigger degree impulsive wave, or the 3rd or even the 5th one. Moreover, it could be the a-wave of a zigzag or the c-wave of a flat or zigzag. This is telling us why Elliott Waves theory is being viewed as a simple trading theory and is complicated if used correctly. The 4th wave in an impulsive move is usually retracing around 38.2% of the 3rd wave. However, this is not a rule of thumb, as sometimes, in strong impulsive environments, the 4th wave is not able to retrace more than 23.6% of the 3rd wave. A rule of thumb, though, calls for the 4th wave not to overlap with the 2nd one. This is, again, a tricky statement, as traders misunderstood such a simple concept. Overlapping is referring to the 4th wave (or no parts of it, to be more exact) not being allowed to enter the 2nd wave’s territory. Not by an inch! 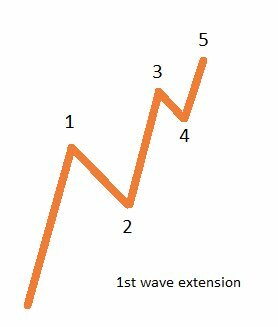 If the 1st wave is the longest wave in the five-wave sequence, it is said that the market is forming a 1st wave extended impulsive move. This is not so common like in the case of a 3rd wave extension, but in the Forex market, it happens a lot. The extended wave is bigger than 161.8% when compared with the length of the 3rd wave. The 3rd wave is not the shortest when compared with the 1st and 5th. The 2nd and the 4th waves are NOT overlapping. The 2nd wave cannot travel beyond the start of the 1st wave. A quick look at the image above tells us that all the rules are respected and that is a proper 1st wave extended impulsive move illustrated there. Keep in mind that these rules are mandatory, but, by all means, are not complete. There are a bunch of other things to look for in an impulsive wave, before being able to put a stamp on a five-wave structure and call it an impulsive move. Nevertheless, if any one of the rules above is not respective, is enough for the overall move not to be impulsive. Elliott said that there is no room for interpretation when it comes to the moves a market makes. That is, if it is not impulsive, only one conclusion can be drawn: the move is corrective. 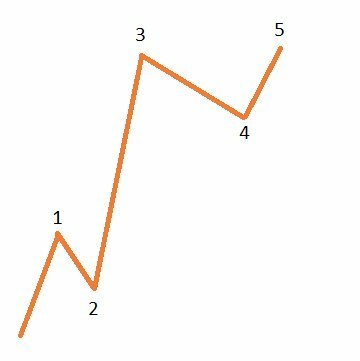 Understanding impulsive moves or the way the waves unfold when the market is moving is crucial in understanding the Elliott theory. This theory is based on so many details that forgetting or missing something that seems irrelevant, may result in a wrong count, therefore a wrong forecast, and, therefore, a bad trade. But when all things fall in the right count, the theory gives outstanding results. It is the only trading theory that allows time to be incorporated in an analysis, and this gives traders confidence when placing a trade.